A Two Day National Level Seminar on “Innovative Strategies to Enhance Quality of Education in Higher Education Institutions (HEI) Challenges, Problems and Solutions in line with Revised Accreditation Framework (RAF)” on 22nd – 23rd February 2019. VIII CONVOVATION NOTIFICATI0N JNTUH - 2019. Last date for applying - 25/02/2019. Three Day Entrepreneurship Awareness Camp (EAC) 2019. SCOPUS Indexed - Springer International Conference on Intelligent Computing, Information and Control Systems (ICICCS) - 2019.
International Conference on Trends in Information, management, Engineering and Sciences (ICTIMES) - 2018. Three Days Entrepreneurship Awareness Camp (EAC) on 24th, 25th, 26th September 2018. Ist MID Exams Time Table September 2018. Faculty Developement Program on Teaching & Learning Process 3rd to 5th May 2018 by Dr. P. John Paul , Principal, MRCE. Faculty Developement Program on "HUMAN VALUES FOR PROFESSIONAL ENGINEERS" on 21-04-2018 by Dr.G. P. RAO Founder , Chairman, SPANDAN. Notification for VII Convocation of JNTU Hyderabad, for the Academic Year of 2016-17, Apply Online, Last Date is 20-01-2018 to 10-02-2018. MRCE is Conducting Alumni Program LAMHE'18 On 06-01-2018 at 10:00 am. All Are Invited. International Conference On Trends in Information, Management, Engineering and Science(ICTIMES) 29th & 30th of November 2017.Organized by Malla Reddy College of Engineering (MRCE). Time Table For Regular / Supply Exams NOVEMBER 2017. R-16 1st Year 2nd Sem & R-15 1st Year Advanced Supplementary Fees Last Date is on 09-08-2017. Those who have detended, they should Collect Undertaking form and submit before 09-08-2017. Faculty Development programme(FDP) on Internet of Things and Sensors for all Engineering Applications on 14th June to 19th June 2017. Alumni meet on 1st April 2017. Our College Annual Day is on 7th April 2017. Free Dental camp for MRCE students and staff on 01-04-2017 at 10:00 AM to 12:30 PM at Block 4. Last Date for Exam Registration Without Late Fee is 25-03-2017 for II & IV year 2nd Semister. Click Here For Refresh Bridge Course Programming Methods & Mathematical skills on 13 th , 14 th & 15 th June 2016. Click Here For REFRESHER COURSE On “Solid-state Physics & Mathematical Skills” 13th , 14th & 15 th June 2016. 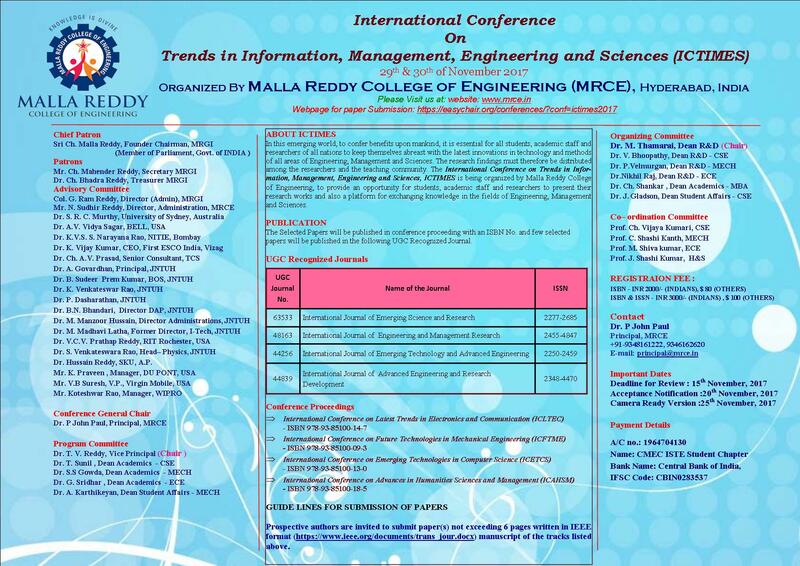 Click Here For Malla Reddy College of Engineering INTERNATIONAL CONFERENCE. Click Here For Refresher course in ECE Department. Click Here For Faculty Development Programme (FDP) in Mechanical Engineering. 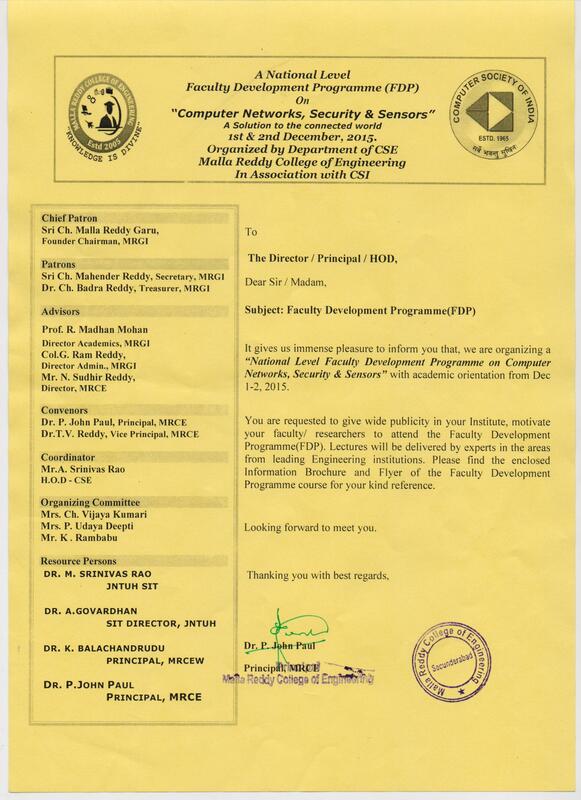 Click Here For Faculty Development Programme (FDP) in Computer Science Engineering.